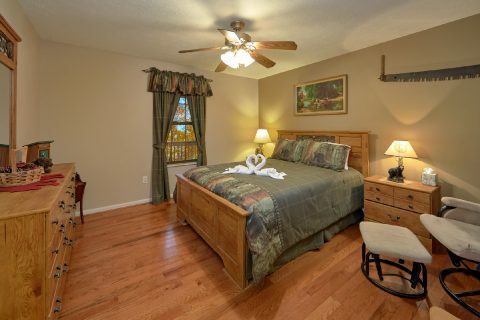 Located in the mountains between Pigeon Forge and Gatlinburg, you'll find "A Bear Trax," a lovely 2 bedroom cabin rental that sleeps up to 6 guests in comfort. 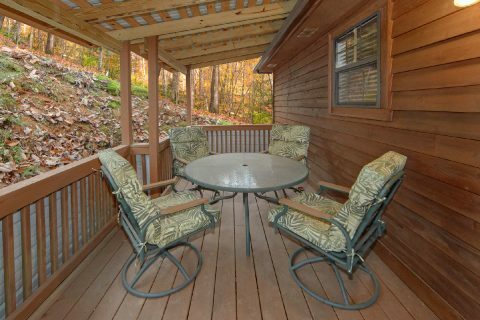 This affordable cabin provides guests with a great location that's close to area attractions. 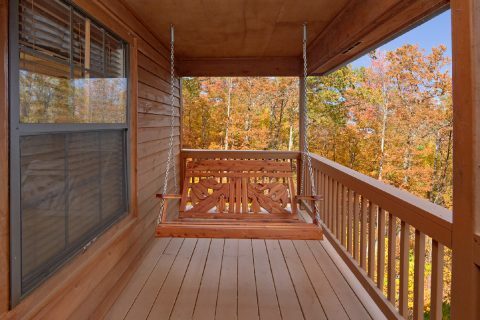 After all, "A Bear Trax" is located only 3.8 miles from the Pigeon Forge Parkway and it's only 6.5 miles from the heart of Downtown Gatlinburg. 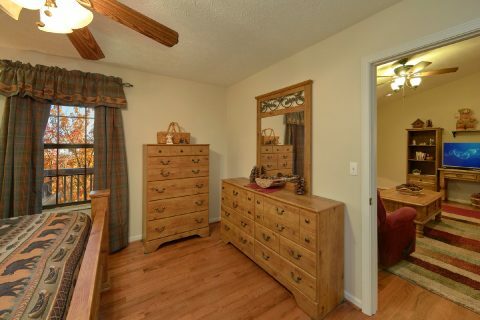 As a result, guests of this cabin can easily reach sights like Dollywood Theme Park, The Gatlinburg Space Needle, and several entrances to the Great Smoky Mountains National Park! 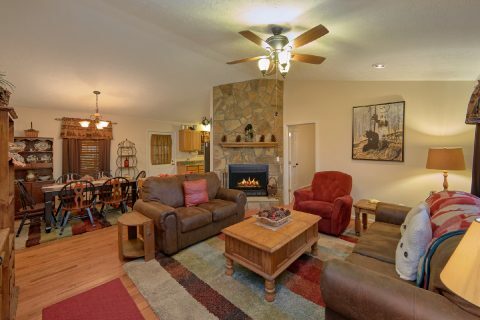 After a great day of exploring the mountains, you'll love returning to this cozy cabin that's located in the Sky Harbor Resort area. 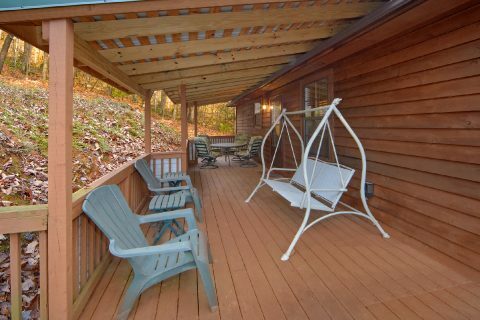 Of all of this cabin's features, you may enjoy the large wrap-around deck the most. 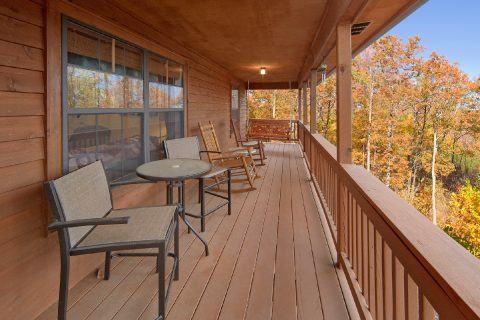 From here, you can enjoy your cabin's forested views while you sit back in a rocking chair or while you eat dinner on the outdoor table and chairs set. 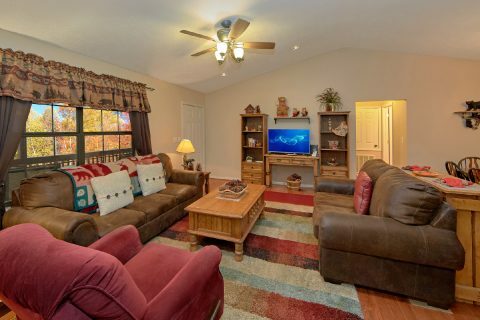 Step inside to your cabin's living room and you'll find a welcoming space complete with a leather sofa, loveseat, and a flat-screen television. 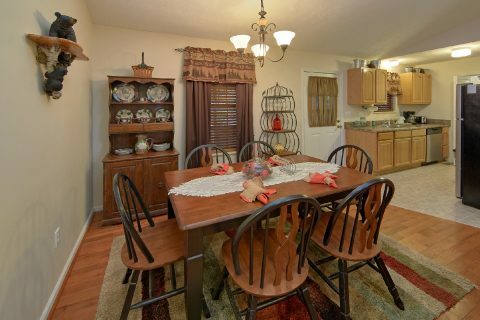 This is the perfect place for enjoying a fun movie night while you relax near the warm wood burning fireplace. 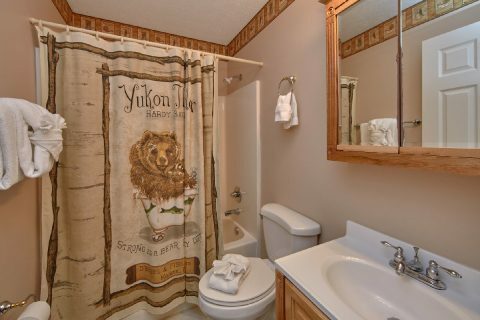 Nearby, you'll find your cabin's two bedrooms. 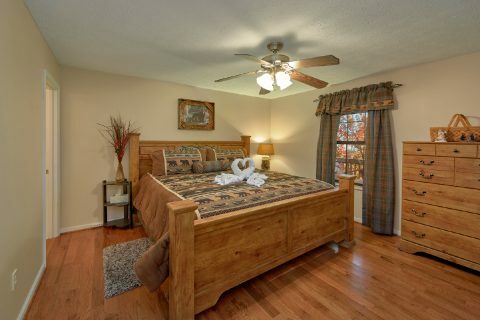 Both bedrooms have a full bathroom and one of the bedrooms provides a king-size bed, while the other provides a queen-size mattress. 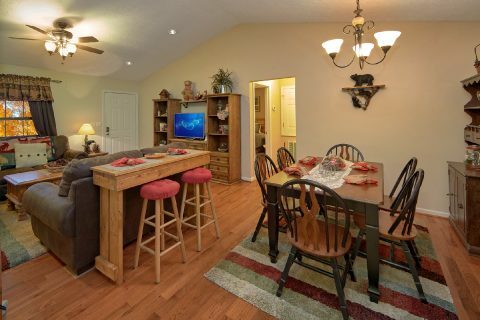 In the living room, you'll find a sleeper sofa to accommodate extra guests. 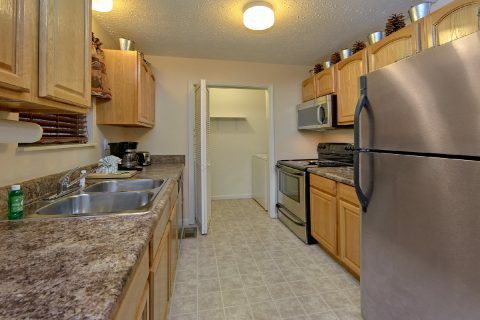 Your cabin comes complete with a full kitchen and a dining area with 6 chairs, so you can cook delicious meals from the comfort of your rental. 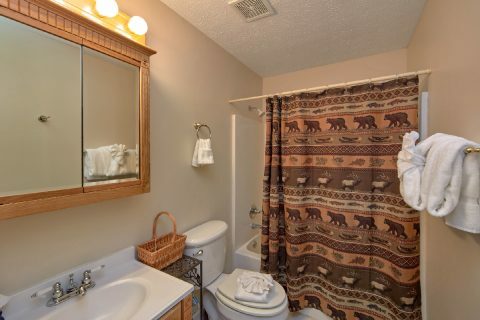 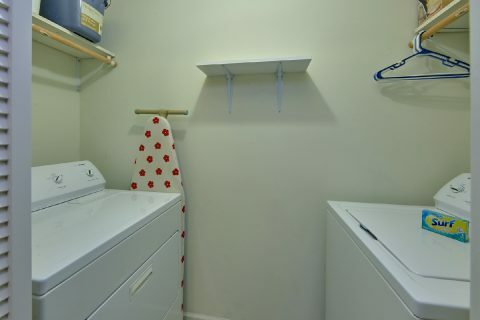 Lastly, "A Bear Trax" comes with practical amenities like a washer & dryer for guests to use during their stay. 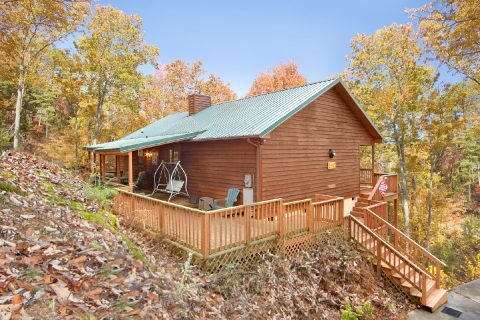 Book this cabin that's close to Pigeon Forge and Gatlinburg today with Cabins USA to earn a special 15% discount on your stay! Simply check this cabin's availability to see how much you can save on your nightly rate in the Smokies!